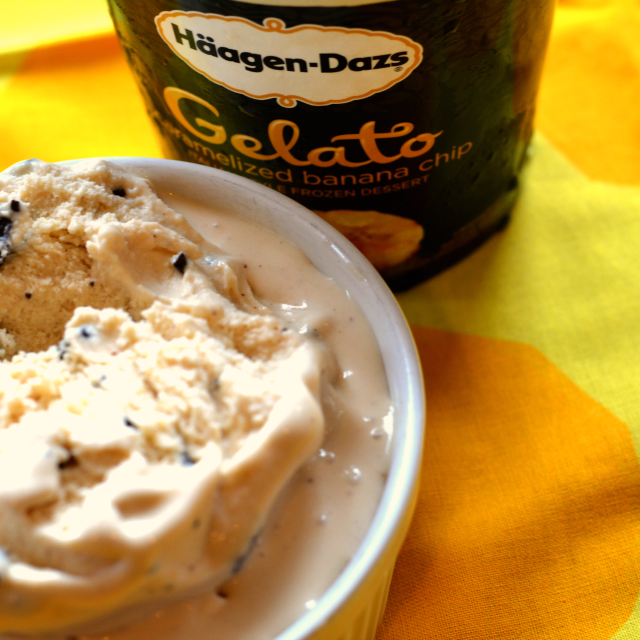 This delicious treat has been compensated as a part of a social shopper amplification for #CollectiveBias and #NewFavorites HÄAGEN-DAZS ice cream. Please don't judge my greedy ways. Surely I'm not the only mom who saves the good stuff for myself. 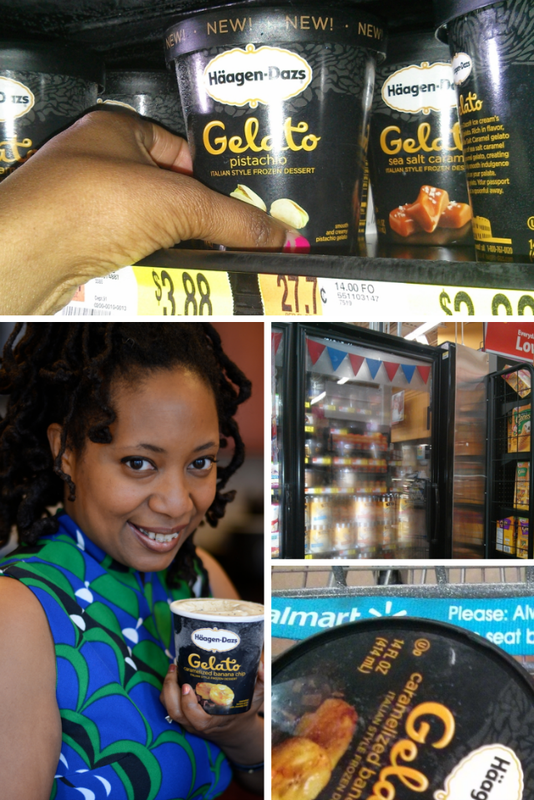 While breezing through Walmart, I discovered new flavors of HÄAGEN-DAZS gelato. I could have just picked up caramelized banana chip but I'm a greedy mom. I grabbed pistachio too. 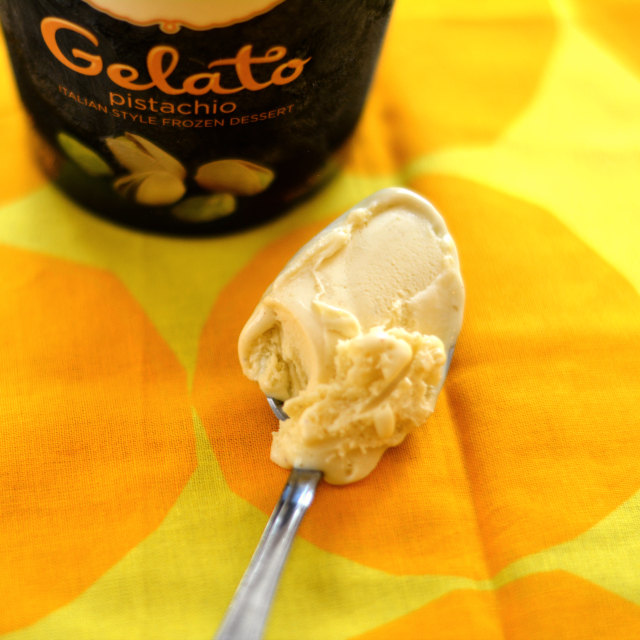 Gelato is my weakness (and cheese) and I don't like to share. 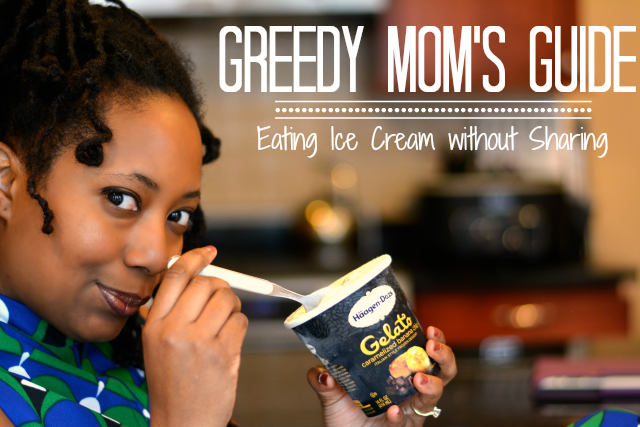 This treat is far too decadent and makes a perfect mom treat. 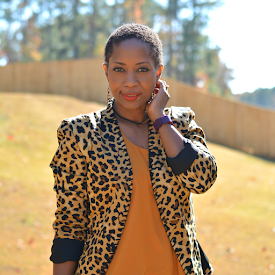 As I do my shopping and errand running while V is in school, I don't always have time to relax and indulge. I wait until I can sit down uninterrupted and eat my treats. Don't worry, I have some delicious carrots for V to snack on. When the kids are all tucked in bed, it's the perfect time to indulge in a delicious treat. Give yourself about 15 mins to make sure they are in fact in dreamland. 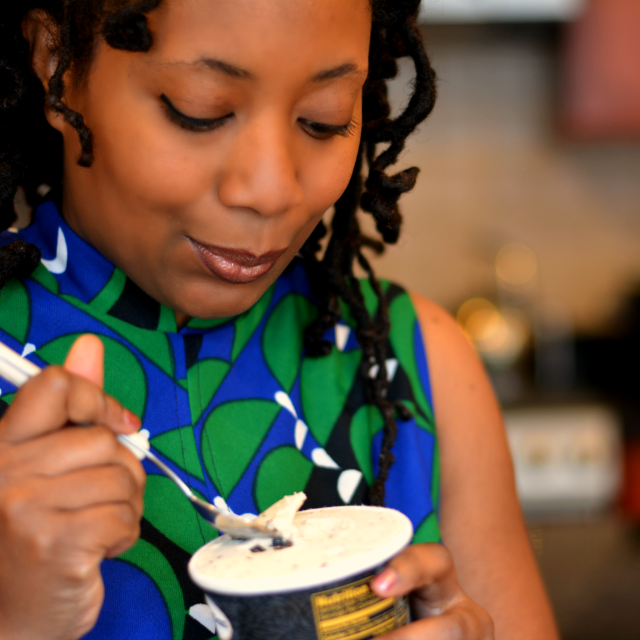 Grab your ice cream and a spoon and go for it! Eat until you're satisfied or a kid senses you're partying without them. This is the hard one. You have to be able to quietly retrieve the treat without arousing suspicion and then disguise your ice cream without the kiddos catching on. Me: Hey Violet, you want to watch Dora on the tv? Me: Ok, I'll turn it on. I have some "laundry" to fold so I'll come back and watch with you in a few minutes. Me: quickly dump a few spoonfuls of ice cream in a lettuce leaf or something similar distasteful to minis (V hates anything green) and sits down for a lovely vintage Dora episode! 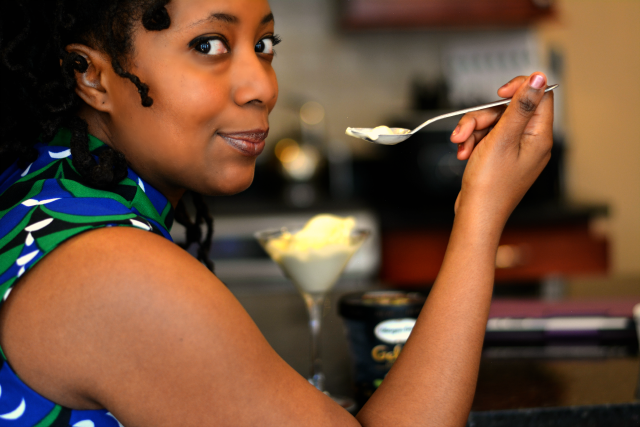 Feel free to grab a spoon, open the refrigerator door and hide behind it while you indulge in a quick bite or two. Some treats are meant to be enjoyed without the worry of a kid disrupting the enjoyment. 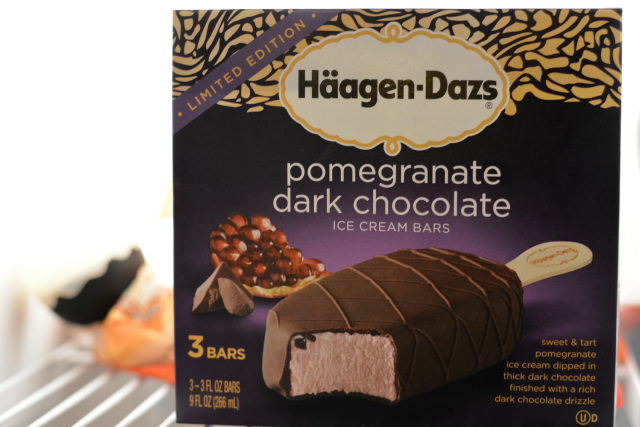 Pomegranate Dark Chocolate ice cream bars are limited edition and hard to come by. It took some time to find these at Walmart. Every local greedy mom has discovered this yummy and is possibly hoarding a few boxes (like I did). Such a good combination of sweet and tart. Only 3 bars in the box. Yeah, wait until the kids are in school for this one! Whether you do it the easy way or the hard way, one must always hide the evidence or you're back to Dora distraction if the empties are seen in the trash or on the counter. It's the last often forgotten step. Don't just throw it in the trash. Bury it in the trash. Better yet. Take the entire garbage out. Do you share your ice cream? HA! I just tell 'em that they can't have any. I just ate the black cherry gelato that they have in one sitting. I am not ashamed either! Am I the only person in the world who has NEVER had gelato? It's on my list,lol. I've never tried gelato and I rarely eat I've cream. I will try some of this though.